A couple of months ago, there was an uproar over Netflix pricing. Netflix decided that they needed to separate their DVD and Streaming offerings. Thus, people would need to pay for each plan separately. The net effect for most people, though was a price increase up to 60%. Needless to say, folks were *NOT* happy. Many people talked about cancelling one of their plans or leaving Netflix entirely. In fact, the loss was projected to hit one million users. It didn’t help when they announced that they’d lose the Starz titles on streaming. I myself toyed with cancelling. We love both their streaming service and their DVD-by-mail service, but it was just going to be too much money. Still, I couldn’t give up access to that many titles. Plus, there was another issue. I figured that perhaps this was an “on paper only” limit that wasn’t enforced. This hope was bolstered by reports from my Twitter followers that they had watched much more than 2 streams at the same time despite being on Streaming Only. 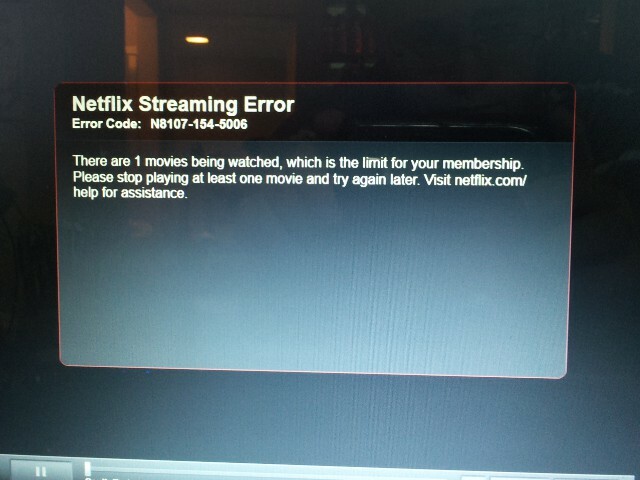 Then, it looked like Netflix decided to enforce the restriction. They claimed that users weren’t restricted, but people kept seeing errors when they tried to view more than 1 stream. Clearly, things were not heading well for Netflix. They had shot themselves in the foot and were bleeding profusely. It was time for quick and decisive action. In a blog post, Reed Hastings, Co-Founder and CEO of Netflix, apologized for the pricing snafu. At this point, I was ready to forgive him. He could have made it all better, addressed the problems, and I would have gone back to being an avid Netflix supporter. I might have even forgiven the price increase. Instead, he shot his other foot. Currently, if you want to find a movie to watch, you load up Netflix, type in the title’s name and you can see whether it’s available via streaming or whether you need to add the DVD to your queue. Once the split occurs, you’ll have to log into your Netflix account to check whether it is available via streaming. If it isn’t, you’ll have to log into your Qwikster account to add the DVD to the queue. This is two separate searches that used to be one search. Customers don’t like having more work added to perform simple functions. Since they will be separate companies, billing and account information will be separate. Need to update your credit card number? You can’t just sign into Netflix and do it there. Now you need to sign into Qwikster as well. Like before, more work = unhappy customers. As Gizmodo points out, Netflix doesn’t own the @Qwikster name on Twitter. This would be a problem if it was just some average person. Unfortunately, the person who owns it is a “foulmouthed pothead” (Gizmodo’s words). Netflix now must either pay the guy a lot of money to get the Twitter handle or get another handle and deal with constant confusion caused by someone who was there first. This could have been solved by a free search on Namechk.com or any other similar service. You don’t announce a service until you have all of your ducks in a row. So what am I going to do? Well, it really pains me to cancel the DVD-by-mail, but I think that’s what I’m going to do. I don’t want to. I really value the service. However, at every turn, it seems Netflix is trying to tell me that they intend on making it harder for me to be a customer. So focusing on just the streaming, I have two main questions for Netflix going forward. First of all, will the streaming limit still be in place? If my kids are watching a streaming movie on the Roku in the living room, will my wife and I be unable to stream to our bedroom Roku? Will additional streams be available as a purchased add-on? If so, how much will they cost? In addition, the blog post claims that more streaming selection is on the way. Honestly, I won’t mourn the Starz loss that much. I went to look at the Starz content and the first 10 pages or so only revealed a handful of movies I’d like to see. If Starz is demanding tons of money for a poor selection of content, then Netflix was right to ditch them. The problem will be what they do with the saved money and how they negotiate for streaming rights. If this separation is for real, they’ve weakened their studio negotiating position. If Quikster-Netflix will still negotiate as one unit with studios then this split is purely a matter of making customer’s lives harder. Either way, it’s a bad move by Netflix. Now they have two feet bleeding. They need to act fast because they have little time to turn this around. I’m not sure they can, to be honest, but to have any chance, they need to start making intelligent, customer-friendly decisions and FAST! Not to mention than having an integrated site would have allowed them to cross-sell their products. Subscribe to streaming only? You’re constantly confronted with the titles you don’t have access to. DVD only? An integrated interface lets you know that you could be watching that RIGHT NOW if only you upped your subscription level.